The Anime Machine defines the visual characteristics of anime and the meanings generated by those specifically "animetic" effects-the multiplanar image, the distributive field of vision, exploded projection, modulation, and other techniques of character animation-through close analysis of major films and television series, studios, animators, and directors, as well as Japanese theories of animation. Lamarre first addresses the technology of anime: the cells on which the images are drawn, the animation stand at which the animator works, the layers of drawings in a frame, the techniques of drawing and blurring lines, how characters are made to move. He then examines foundational works of anime, including the films and television series of Miyazaki Hayao and Anno Hideaki, the multimedia art of Murakami Takashi, and CLAMP's manga and anime adaptations, to illuminate the profound connections between animators, characters, spectators, and technology. 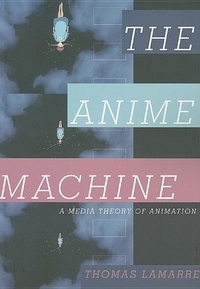 Working at the intersection of the philosophy of technology and the history of thought, Lamarre explores how anime and its related media entail material orientations and demonstrates concretely how the "animetic machine" encourages a specific approach to thinking about technology and opens new ways for understanding our place in the technologized world around us.